Small (6-12 months) - $48.99 Only 8 left! Medium (18-24 months) - $48.99 Only 4 left! Large (2T-4T) - $48.99 Only 2 left! Anyone who has children or grandchildren (or even just has children in their neighborhood) knows that having infants and toddlers running around can make you feel like a zookeeper! From chasing them around to getting them to eat and sleep, it can feel like our little animals will never settle down. If this sounds like a child you know, then this toddler tiger costume may just be the perfect fit for them this Halloween. Treat them like the tiger they are with this striped tiger jumpsuit and then set them loose on the neighborhood for a little trick-or-treating fun – though you’ll still have to play the role of zookeeper! Does your child act like an exhibit at the zoo sometimes? It's about time you put his wild and ferocious nature to use! He might not have the stripes of a tiger just yet, but after you dress him up in this tiger costume he will. Then your dream of owning your own zoo will become a reality. After that, it's time to rule the world...or just snuggle with your adorable little jungle animal. Whatever floats your boat. This adorable jumpsuit is 100% polyester and has a Velcro closure in the back for a quick and comfortable fit. The plush tail is attached as are the matching shoe covers so your little one can look like a tiger from head to toe! Put on the tiger headpiece and paw mitts to complete the look. 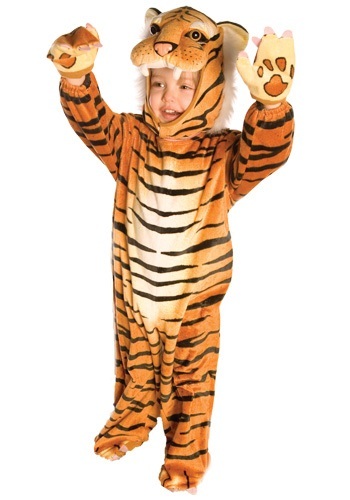 This toddler tiger costume will also keep your little one warm on a cool Halloween night out trick-or-treating.